Such a dilemma! You don’t want to consult the temple medium or fortune teller for an auspicious date. Perhaps you think it is too superstitious to believe a date will have any effect on your wedded bliss. Perhaps you are a Christian but your parents are not. They think it is most important that they select an auspicious date to ensure a successful marriage for you. They feel you are ungracious for objecting to their kind intentions. If you are a Christian, what is a suitable middle ground? There really isn’t any good or easy answer. Perhaps there should not be any middle ground. It is too fine a line to tread. But such is life when you and your loved ones have different beliefs. You need to choose your battlefronts. I think it is really up to your personal conviction. I am a Christian, my parent’s are not. When I got married, our compromise was to select a date using the chinese calendar. No consulting of temple medium, and no reference to specifics of our birthdates and times. To me, it was just choosing a date out of the chinese calendar, like picking out a date on a weekend or public holiday. To my parents, they were able to avoid really “disastrous” dates on which no weddings should take place. So what's on the chinese calendar? bottom, showing the fengshui/chinese astrology information. Wise sayings are usually printed along the two sides of chinese calendar. They can be quite enlightening. Here’s one that I like, ”欲人无闻，莫若勿言。欲人勿知，莫若勿写。”which means “If you do not want others to hear, don’t say. If you do not want others to know, don’t write”. find all the auspicious chinese dates, then decide on the Gregorian dates within these. To determine if the date is auspicious, read the sub-sections, titled 宜(yi) which list the favorable activities for the day, and 忌(ji), activities to be avoided. Locate the corresponding term for wedding event Wedding day 嫁娶, Betrothal 结婚纳彩/采 or install bridal bed 安床 under 宜 or 忌. If found under 宜, it’s a good date for that event, if 忌, don’t select that date. The date is neutral for that event if nothing is mentioned. Important note: Certain days are not favorable for all joyous events and are listed as “不宜诸吉事” under the 宜 section. 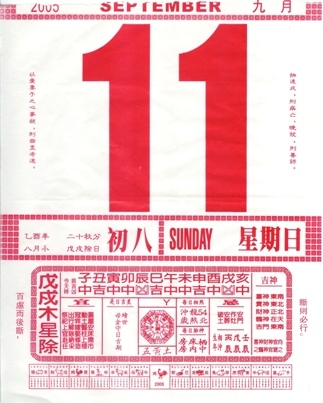 For such an unfavorable day, 忌 section will also list 吉事 meaning to avoid all joyous events. Some people also want an auspicious timing for events such as fetching the bride and entering the groom’s home. Check the auspicious rating under “今天时辰吉凶”. The timings are listed as 吉 auspicious timing, 中 neutral timing and 凶 fierce or bad timing. Choose those that are 吉 or 中 and avoid timing listed as 凶. 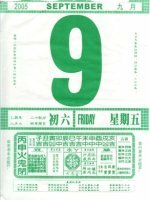 Learn more about the history of the Chinese Calendar from WebExhibits.org. 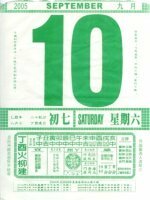 The chinese horoscope that “clashes” on that date is listed with the age under a section titled 每日相煞. Under 生年相冲 the other years of the same horoscope that also “clashes” is listed. It is interesting to note that not all the years of the same horoscope is listed as “clashes”. It is a mystery to me and I’ll leave it at that. Not sure what is your chinese horoscope? No worries, just click here to find out what is your chinese horoscope.